Here we are with a new bunch of great inspirations regarding modern floor lamps, this time with a selection of silver floor lamps for your home or project. What can we say? Silver is a metal that never gets demodé. We have gold and we have copper as the new trends in the last two years but silver seems to maintain its strength. Lee Floor Lamp by DelightFULL Unique Lamps. Adjustable Metal Floor Lamp in Polished Nickel. Halo Touchier Lam Floor Lamp from Lecacy Home . 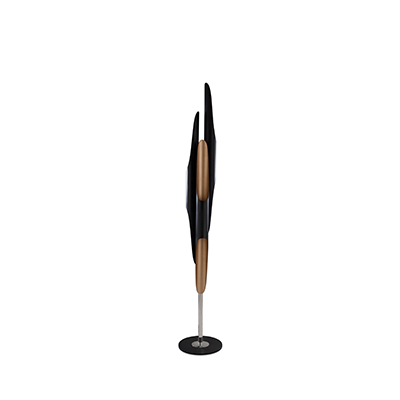 A silver floor lamp with a black shade and wooden feet. Diana Industrial floor lamp by DelightFULL Unique Lamps. Mirror Ball Stand by Tom Dixon. Scofield lamp by DelightFULL Unique Lamps.